Japanese scientists have successfully cloned a prize beef cow more than 13 years after it died, it was announced on January 6. The legendary steer -- named "Yasufuku" in his first life (1980-1993) -- is regarded as the father of Hida beef, a high-quality meat from Gifu prefecture famous for its marbled texture and rich flavor. During his 13-year life, the prize bull's sperm was used to sire 40,000 calves, helping to establish Hida as a high-class brand of beef. It is believed that more than 30% of the nation's Japanese black cattle can trace their roots back to Yasufuku. To produce the clones, researchers from the Gifu Prefectural Livestock Research Institute and Kinki University (Osaka prefecture) employed a somatic cell nuclear transfer method using the nuclei of cells extracted from the bull's testicles, which had spent 13 years in deep-freeze. The first clone of Yasufuku was created in 2007. In all, four clones of Yasufuku have been born, although one died from complications after birth. The results -- which were scheduled to be published in the US journal PLoS ONE on January 8 -- suggest it is possible to "resurrect" animals valued for their high-quality meat, long after they have died. Some suggest the cloning method can also be used resurrect prize pigs and horses. The rebirth of Yasufuku follows the recent success of another cloning experiment involving mammals held in long-term frozen storage. In November 2008, a RIKEN research team cloned a mouse from a carcass that spent 16 years in a freezer. Teruhiko Wakayama, the RIKEN genetic engineer who led the effort to clone the frozen mouse last year, reacted to the news of the cloned frozen cow. "I was surprised to learn that the researchers found usable cells in the frozen tissue," said Wakayama. "[Their findings suggest] it is now possible to clone cows from delicious beef found on the supermarket shelf." News of this latest cloning success comes as the Japanese government grapples with whether or not to allow cloned animal products into the food chain. The Cabinet Office's Food Safety Commission is currently looking at scientific data from a variety of Japanese and foreign sources in an attempt to evaluate the safety of cloned animal products. The commission is scheduled to present its decision to the Ministry of Health, Labor and Welfare later this year. Lawmakers will then have the final say on whether or not to approve the sale of cloned meat to Japanese consumers. In 2008 (between January and September), researchers in Japan are known to have created 557 somatic cell cow clones. In response to consumer distrust of cloned meat, the Ministry of Agriculture, Forestry and Fisheries (MAFF) currently requests research institutions to take voluntary measures to prevent cloned cows from ending up in the food supply. 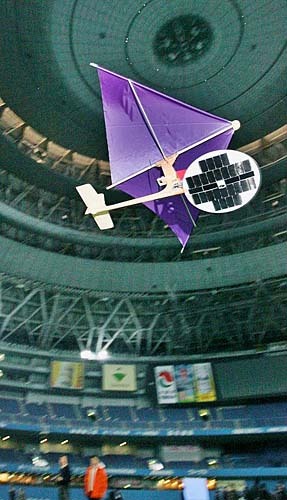 An unmanned aircraft powered by a ground-based laser was demonstrated at Osaka Dome on March 7. The aircraft is the work of a Kinki University research team led by Professor Nobuki Kawashima (aeronautical engineering). The researchers expect the aircraft to be used for gathering information in the event of a disaster. The aircraft measures 78 cm (30 in.) long, weighs 800 grams (1.8 lbs. ), and has wings like a kite. A disc-shaped solar panel attached underneath powers the propeller when struck by a ground-based laser. A battery powered the aircraft�s propeller at takeoff, but once it reached an altitude of about 50 meters (165 feet) -- near the ceiling of the dome -- the aircraft switched to laser-powered flight. The laser remained on target (error less than 1 cm) throughout the 20-minute flight around the dome. Observers say the aircraft looked like a kite flying on a string of light. Flight time with this technology is unlimited as long as the laser can reach the aircraft, as opposed to a 5-minute flight time when powered by battery. Researchers envision this type of aircraft being used to get an understanding of areas devastated by earthquake or flood, or to serve as flying communication relay stations. Leisure-related applications are also possible. "We would like to extend the tracking distance and increase the size of the aircraft," says Kawashima. "Hopefully we can make it commercially available in about 2 or 3 years."